We had an incredible opportunity to check out the Steamboat Natchez last night, a jazz river cruise aboard an authentic steamboat!This dinner cruise rolls down the Mississippi river, while entertaining their guests with Cajun food and live Jazz music.As you can tell from our apparel, it was very cold our first night in town. I had to buy gloves and a ear warmer! Luckily for us, the steamboat was climate controlled. Upon walking up to the steamboat, we heard a calliope (a steam organ that can play 32 notes) playing music on the boat. I know it sounds quirky but this made me really happy - the steam was dancing with the music and I felt like I stepped back in time. It was an enchanting beginning to our dinner jazz cruise. Once we boarded the steamboat, we learned some history of the ship.The ship was built in 1975 and was used by U.S. President Gerald Ford as part of his Natchez political campaign trip to the Southern United States. The wheel is made of white oak and steel, her steam engines were originally built in 1925 for the steamboat Clairton. 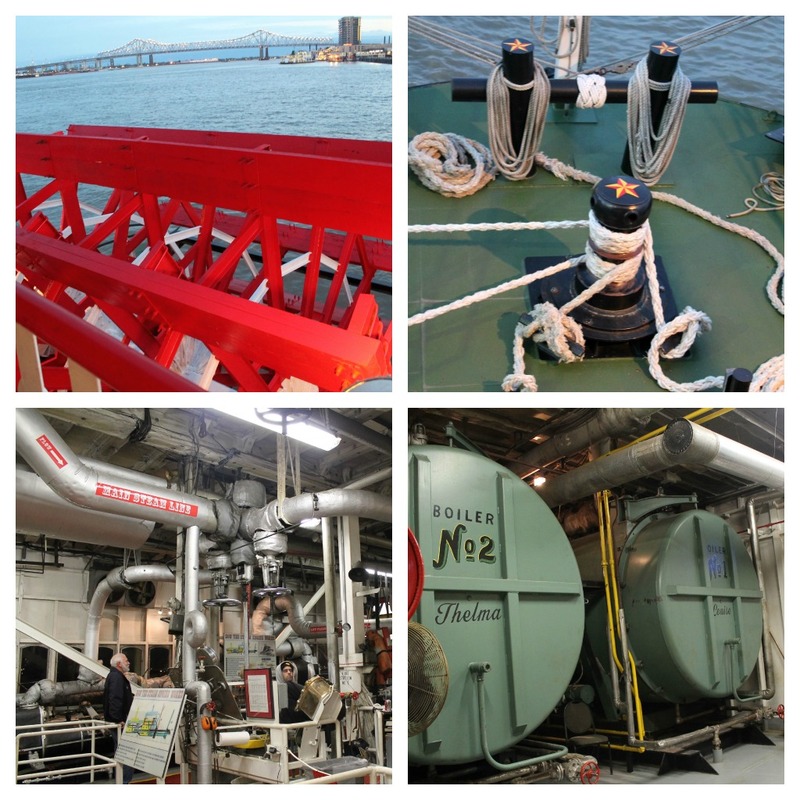 From the S.S. J.D. Ayres were taken the copper bell, made of 250 melted silver dollars. The bell has on top a copper acorn that was once on the Avalon and on the Delta Queen. The broilers are named Thelma and Louise. When I asked why, I was told "Just Because" and that the previous boilers were named "Laverne and Shirley". History lesson is officially over. Let's talk food and entertainment! We were entertained by the Dukes of Dixie Land, who truly impressed us. We listened to them while the first dinner group ate. 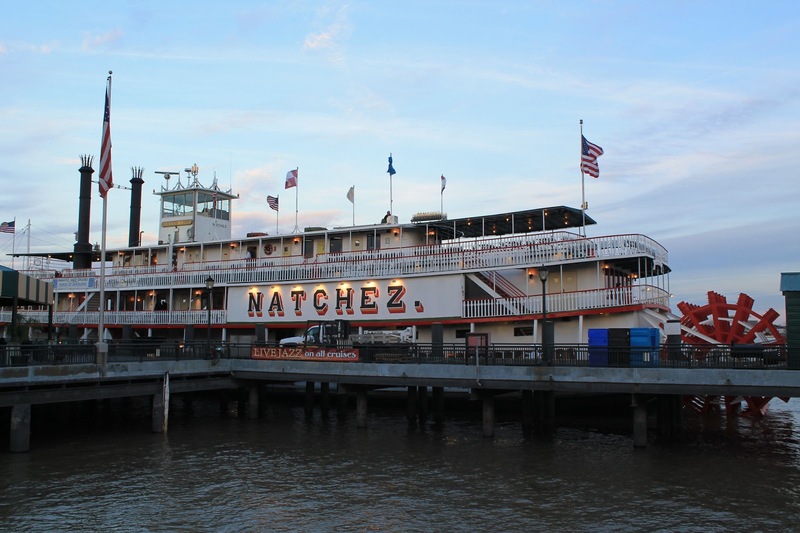 The Natchez has two dining times to give their guests time to eat, be entertained and mingle with others. Natchez has a private room called the Magnolia Suite which is available for parties. We took the second dining time and enjoyed meeting other guests while sipping on a few very strong cocktails. The bartenders on the ship know how to make a drink (and they are very inexpensive! $6 for a cosmo!). 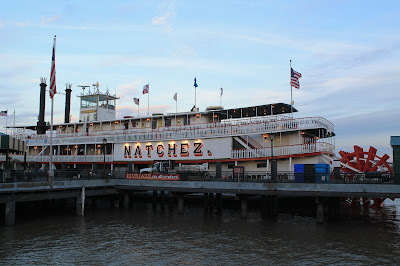 For our dinner, on the Steamboat Natchez, we were offered a menu of: Steamboat Salad Salad, Louisiana Style Fried Fish, Bronzed Chicken, Top Round of Beef with au jus, Paddlewheel Pork Loin with Creole Mustard, Penne Quattro Formaggi, Pilot House Potatoes, Maque Choux, Creole Creamed Spinach, and Bread Pudding for dessert. 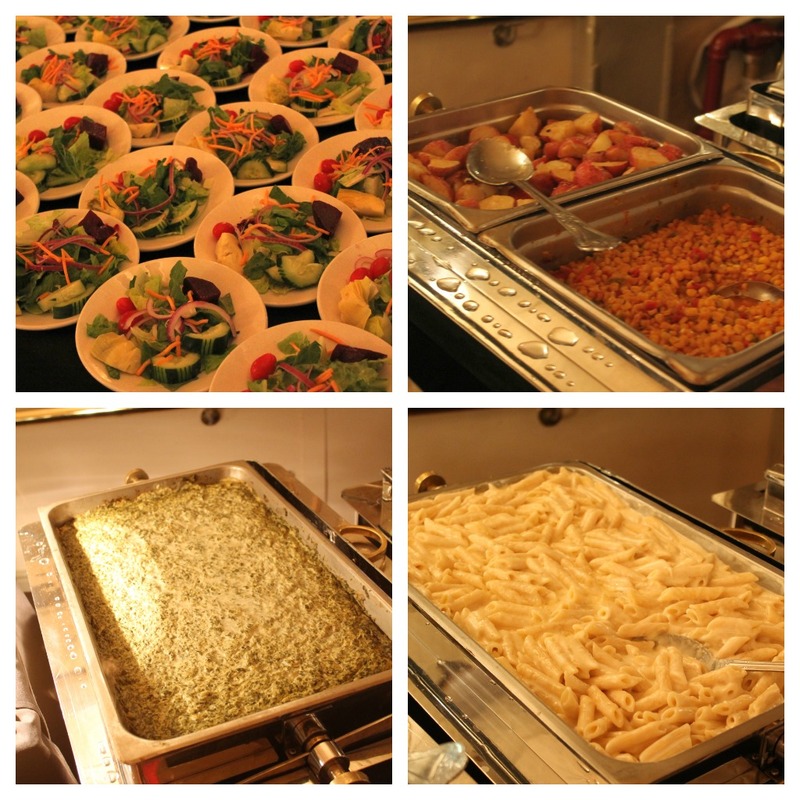 I was very impressed with the food. 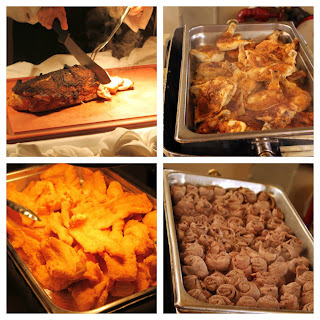 Since it was buffet style, I came in with buffet expectations but everything we had was tender, juicy and very flavorful. 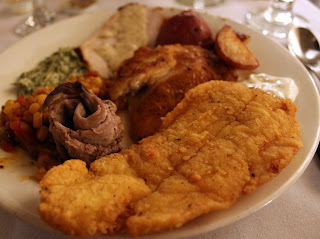 I loved the Maque Choux and Pork Loin! Far above my expectations. 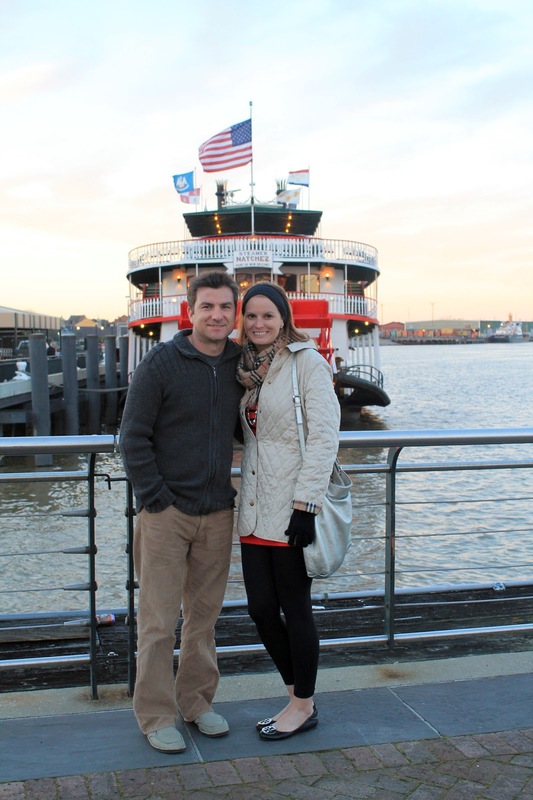 We had an amazing time aboard the Steamboat Natchez. 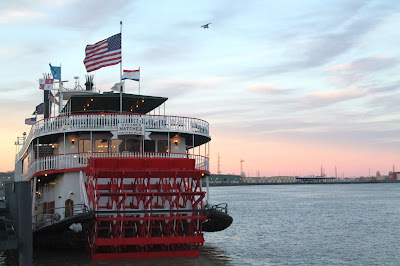 I would suggest anyone visiting the Big Easy to go on a dinner jazz cruise. 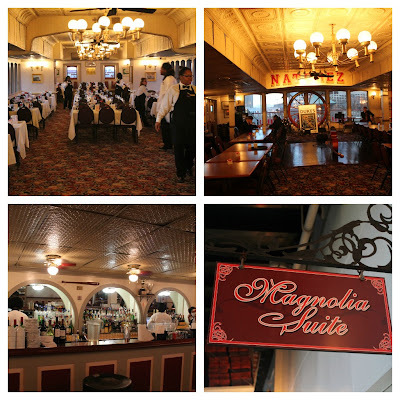 It is a chance to learn New Orleans history while listening to amazing Jazz and meeting new people. The staff was very nice and accommodating. This was the perfect beginning to our vacation in NOLA! 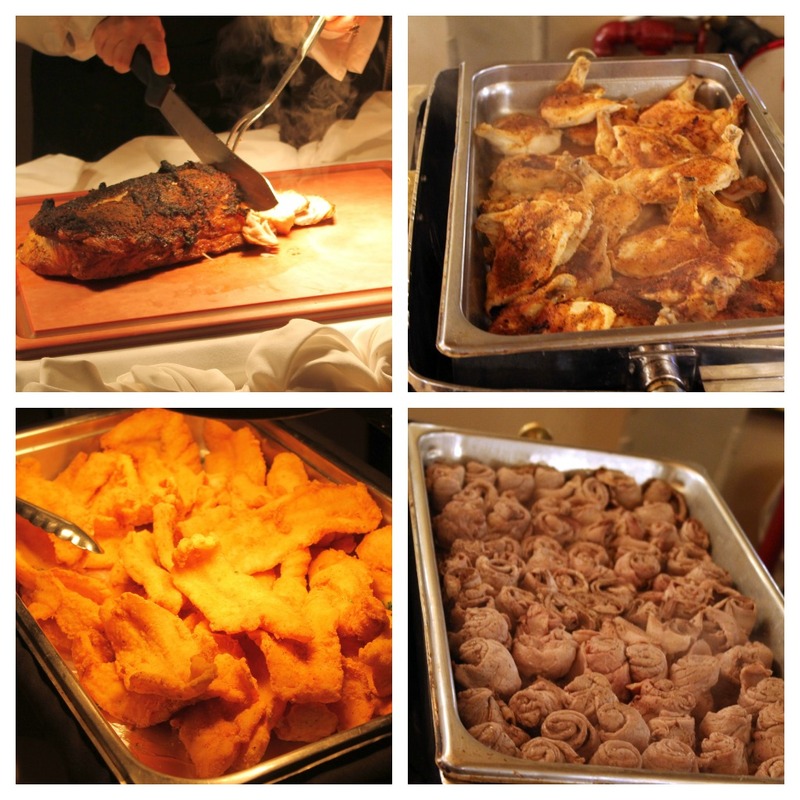 You can follow the steamboat on facebook by clicking here to keep up with events and specials. It was so much fun!!! It was so freaking cold though....I hated not being outside on the deck with the sunset. Next time!! Sounds like a really fun way to spend an evening for sure!!! Great way to start off your NOLA adventures!